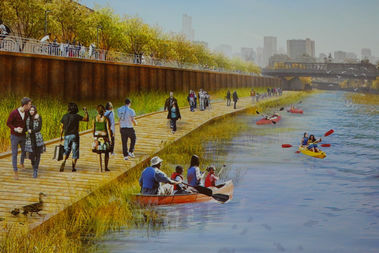 A riverside walkway and wetlands along the Chicago River canal on the east side of Goose Island constitute one open-space proposal for the North Branch Industrial Corridor. GOOSE ISLAND — The city's Department of Planning and Development laid out no proposals for a major new park at a community meeting on the North Branch Industrial Corridor Tuesday, as local leaders complained about the lack of input on public open spaces. The two-hour meeting at UI Labs on Goose Island was mostly devoted to a department presentation on the corridor modernization plan, an attempt to update development guidelines for the area running on a diagonal along the North Branch of the Chicago River from Chicago Avenue to Fullerton Avenue, including the new Finkl Steel project. "What about thinking to the future about open space?" RANCH Triangle President Reatha Kay said when the meeting was finally opened to questions from the standing-room-only crowd of hundreds. "There's already an open-space deficit here, and there really won't be an opportunity to add to that once this area is developed." "What about thinking about open space?" RANCH Triangle President Reatha Kay said at Tuesday's meeting. While respectful of the meeting and its aims, Ald. Michele Smith (43rd) gave a strong defense of public calls for a major new park in the area. Calling it "a once-in-a-lifetime opportunity" to add a major new park to an area growing in population, with more housing developments planned along the corridor, Smith said that already "our recreational resources are completely overtaxed." Smith said that additional residents in the corridor, as it potentially shifts to a 50-50 split of homes and businesses north of North Avenue, would be forced to used "overburdened" existing areas like Oz Park. "It's really our only opportunity to get some useable open space," Smith added. Smith has urged for months that the North Branch Industrial Corridor plan account for a needed new park. She was joined by Ald. Brian Hopkins in an op-ed piece calling for such a park to be set aside. While more measured, Hopkins too spoke at the meeting and said they were joined by Aldermen Walter Burnett Jr. (27th) and Scott Waguespack (32nd) in making clear to Mayor Rahm Emanuel and his administration that additional park space is a priority. "They understand we need more recreational space," Hopkins said. "For me, this is just the beginning of my community process," Hopkins said, adding that he'd hold developers' feet to the fire in requiring that individual projects account for open space with facilities like soccer fields. He specifically cited Sterling Bay, developer of the Finkl Steel along the river north of Cortland Avenue. Acting as a consultant on the plan, Ernest Wong agreed that tacking park space onto individual developments was the best approach, echoing other department staffers in saying the city is reluctant to seize land to set aside space for a major park. A landscape architect who has been hired to do work on the upcoming Barack Obama Presidential Library in Jackson Park and also an Emanuel-appointed member of the Commission on Chicago Landmarks, Wong allowed, "One of the biggest things we heard was the desire for open space." He insisted the city would be adding 50 acres of open space, as the current plan proposes 32 acres along a North Branch River Trail, 17 acres of a wetland park set in the canal along the east side of Goose Island, as well as the so-called turnaround basin just south of North Avenue. Wong called the canal "heavily underutilized right now." Smith has previously rejected the riverside walkway as insufficient, saying, "We're not interested in a Downtown-style plan to put a little green space along the river. We need substantial recreational space in this community, and we don't have it." 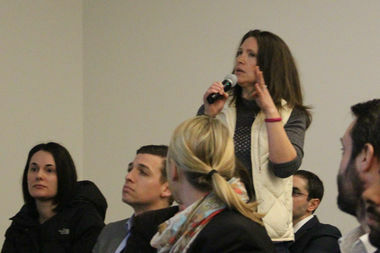 Eleanor Gorski, deputy commissioner in the Department of Planning and Development, said the city was "trying to listen to all the constituencies here." "We certainly have heard about the open space and the needs in the area," Gorski said. The department expects to present its modernization plan for the corridor to the Plan Commission in April or May. Gorski called it "a planning tool" to establish a "land use and development framework" for the corridor in the decades to come, especially addressing the shift from product manufacturing to other industries, such as technology and information, and the need for new housing to accommodate new workers in those areas as the city moves on into the 21st century. "This [area] needs to continue as an economic engine," Gorski said. "That's why we're here."